Ripe passion fruit and pineapple on the nose, and fresh minerality. Very rich on the palate, well balanced. Honey, tropical fruit flavors and a great finish. The wine is excellent. 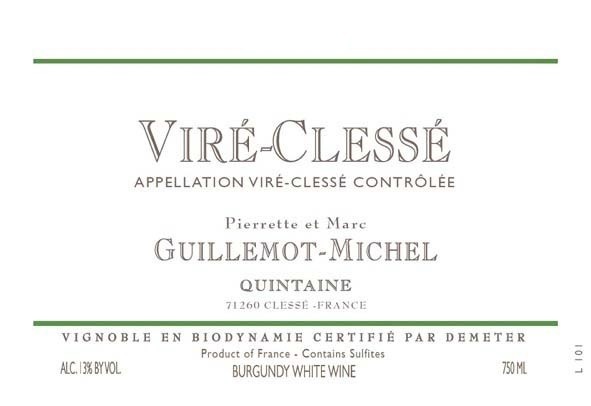 "Notes of Acacia honey, musky peach, beeswax, fresh apricot and dried white flowers introduce the 2016 Viré-Clessé, a silky, medium to full-bodied wine with exceptional concentration, textural elegance and length on the finish. Despite its ripeness and subtly botrytis-inflected character, it's underpinned by tangy acids and remains beautifully balanced and integrated. This is well worth seeking out. – William Kelley"
"Medium yellow. Yellow fruits, orange blossom, smoke and flint on the nose and palate. Thick and saline on entry, then seriously deep in the mid-palate, with suggestions of exotic fruits perfectly countered by strong saline minerality. I love the balance of sweet and salty elements and vibrant acidity. The slowly rising finish is very long and smooth. This wine, made from vineyards that have been Demeter-certified for more than two decades, boasts a thickness that few 2016s from the northern Mâconnais can match. I'd love to follow this unctuous yet energetic Viré-Clessé as it loses some of its baby fat but it's approachable already owing to its texture and balance. - Stephen Tanzer"
"A tiny biodynamic estate making highly individual wines; the grapes are picked ripe, resulting in high alcohol levels and viscous textures; residual sugar not uncommon here." This 7-hectare (17.3 acres) vineyard on a clay and limestone based soil has been cultivated through biodynamic and organic methods since 1991 (the Biodynamic method regards the earth as a living organism and strives to renew the soil in order to produce food that is full of vitality and deeply nourishing. Biodynamics notes the interrelationship of all kingdoms - mineral, plant, animal and human - and their intricate correspondence to the rhythms and activities of the larger cosmos). That means they work in harmony with the cycle of the vines and the soil. They don't use any chemicals and prefer mineral and vegetal treatments. They work the soil using manual and mechanical methods but they treat the vines only manually. The wine is 100% Chardonnay and goes through 100% Malolactic fermentation with no use of oak. The vines average 45 years of age with a typical yield of only 2.5 tons per acre. Marc and Pierrette are constantly experimenting, searching for new ideas, willing to take on board both traditional and modern methods. Tears of happiness, passionate and sensual, are brought on by this blend, from the most intimate place, to transform them into pleasure and hypnotism. The cinammon of the soul is combined with sweetness and delirium in this original "assemblage". It is an intense greenish-yellow wine with luminous golden highlights. It has fresh, elegant floral aromas lent to it by its grape varieties, as well as a touch of oak from its oak aging. On the palate it has very good body, and good unctuosity but at the same time is fresh and floral. It is a wine of great delicacy and subtle elegance. Light gold colored with a perfume of candle wax, pear, melon, and toasty oak, on the palate the wine is medium-bodied with well-integrated oak, dry flavors, a creamy texture, and outstanding depth and concentration. "The white 2015 Lágrima Canela felt better balanced than the 2013 I tasted last time. It's a blend of Chardonnay from Gualtallary with 30% Semillon from Tunuyán in the Uco Valley. It's a barrel-fermented blend that matured for eight months in new 300-liter French oak barrels, but somehow the fruit is in the forefront, and the oak feels better integrated than in the past. The palate also has very good freshness and is nicely textured, with an impressive, long and persistent finish. It's very tasty and faintly balsamic. It's very drinkable now, but time in bottle should only do it good. 5,000 bottles were filled in November 2015. Luis Gutiérrez"